Hello lovelies! I am back with the promised review of the Kindara Wink basal body temperature thermometer. I recently introduced to my readers that I had purchased the Wink thermometer in my blog about Castor Oil Packs, a holistic approach to women's health. 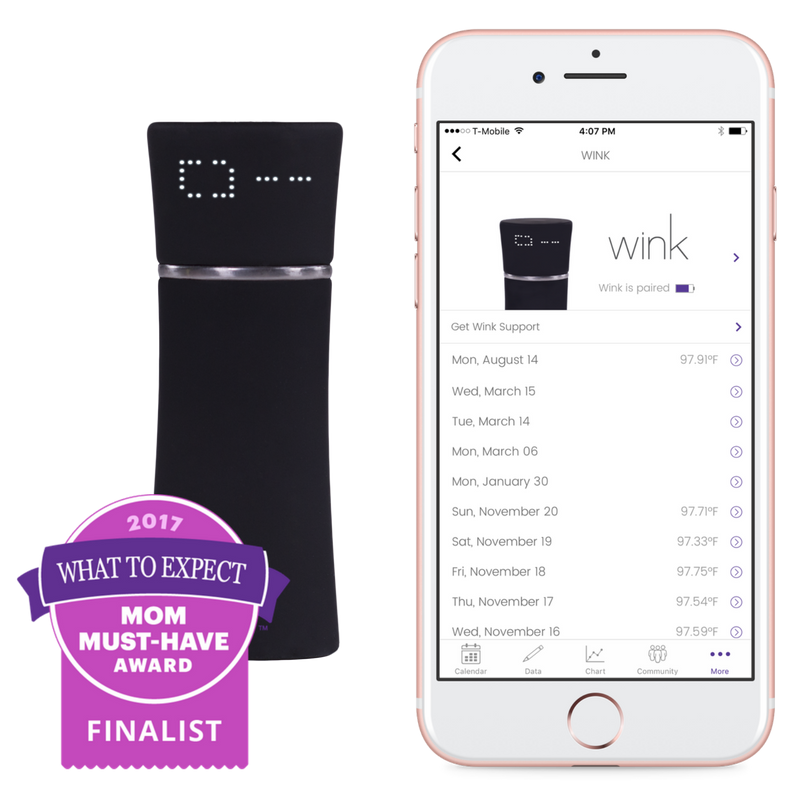 The Wink thermometer was developed for use with the Kindara app, a comprehensive tool for women to track their monthly cycles and reproductive health by adhering to the Fertility Awareness Method system. As a long time devoted user of the Kindara app, the new Wink thermometer has been very much appreciated in the even of me having to remember to enter my daily temperatures. The Wink thermometer also has some features that I have found to be much more appealing compared to my old thermometer which I will discuss more in detail. First off, what is Fertility Awareness Method? Kindara has a quick description on their website depicting the science of the system. There are numerous resources available online for learning more about the FAM system as well as reputable texts including the highly recommended book by Toni Weschler, Taking Charge of Your Fertility. Basically, FAM is a system of charting your monthly cycle to determine the optimal time for achieving or avoiding pregnancy. Most women begin using the FAM system as a means of natural birth control or as a supplement to additional non-hormonal birth control. As those women's lives progress, they may decide they are ready to begin their family and having the knowledge base of the FAM system, they find their ability to conceive much easier and less stressful. Or if they have found cycle abnormalities by the use of FAM, they have that information at their disposal to present to the appropriate doctors for treatment measures. Learning FAM can be overwhelming at first, especially if you have never been taught the fundamental concepts regarding the female body. After learning and using the system, it constantly surprises me that as a woman, I was never taught these very basic concepts about my own body. It's a shame our society does not place an importance on this very natural and healthy way of how a woman's body functions. A little education for developing young girls can go a long way. Kindara is an app that allows women to track information and incorporates it into a chart that serves as a tool for women to determine their most fertile days of the month and when ovulation has occurred. Our cycles are comprised of a Follicular Phase and a Luteal Phase. The Follicular Phase is the egg maturation and ovulation phase. The Luteal Phase is post ovulation and can be visualized on a chart by the change in basal body temperatures. This is why a thermometer is used and temperatures are taken and recorded every day around the same time upon waking after at least three hours of consecutive sleep. The basal body temperature is your "resting" temperature or the lowest body temp. Once you begin moving around after waking, your body's temperature will rise which is why you must take your temperature immediately upon waking. I've been taking my temperature every morning upon waking for about five or six years now. I got a thermometer from Amazon and have used it religiously. I loved this thermometer and never thought to change it. It had it's own case for travel, was easy to clean, would beep when the temperature was ready, had a light up screen to view the temperature, and overall worked pretty well for me. As I got into the habit of temping, I sometimes would neglect charting my temps into the Kindara app and once my thermometer exceeded it's daily records amount in it's memory function, it would cease to save temps. This often lead to me missing temps in my chart. Another downfall was when I first wake up, it's often because I have to urinate. This thermometer could easily take three to five minutes before it would beep signally my temp was done being taken. Sitting in bed and waiting for a thermometer when you have to pee is not the best feeling. Despite the fact my old trusty thermometer did the job, it was time to move on. 1. Portability. Small and discreet. It actually looks like a makeup item which made it very easy to throw into my makeup bag when traveling. 2. Battery charging capability. My previous thermometer required me to get out some screw drivers and take apart the back panel of the thermometer to replace the battery. The Wink thermometer allows you to charge up via USB. The Kindara app also enables you to view the battery life on the Wink thermometer easily. 3. Syncs temps to Kindara. I don't have to remember to log my temps daily for fear of losing the data if I don't. The thermometer syncs my temps into my chart for me. 4. Quicker temps. This little device is so much faster. It takes about 30 seconds or less to acquire my temp. 5. Silent temp notification. The thermometer vibrates to alert you the temp is complete. This is nice for those who co-sleep with spouses or others that would be easily awakened by a beep.